Angina is a sharp pain in the heart, which does not pass over a short period of time. During the attack, the pressure may rise, but it comes back to normal spontaneously. Bouts of severe pain and a feeling of compression in the chest in the heart area can be a sign of angina pectoris better known as angina. A sudden pain in the chest region originates due to a lack of blood supply of the heart muscle. 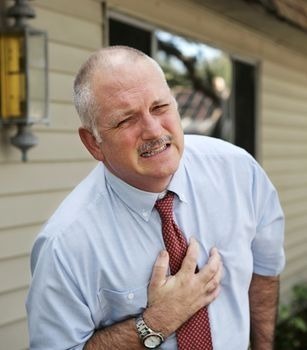 It is necessary to take measures without delay, as angina may be a sign of myocardial infarction. Lie on your right side or sit down in order to relax the body if you feel pain in your chest. Open the window for the fresh air which will help alleviate your condition. Put nitroglycerin under the tongue as it will help stop an attack of angina pectoris. If after 2-7 minutes, the pain is not relieved, take another nitro-glycerine tablet. Make sure you always have this drug at home and in your pocket or purse, because the attack can happen during any inopportune moment. Dissolve tablet in 50 ml of water. This will help you to reduce heart rate and lower blood pressure. Take a soothing drop courses: 15 days drink them. It is better of take 15 days a break in a month. Drink a sedative tea of ​​motherwort herb. Brew a tablespoon in a glass of boiling water. To avoid the taste of bitter herbs, add one tablespoon of honey to the mixture. Drink 50 g four times a day. If it does not suit you, replace it with the fruits of hawthorn and wild roses. Make a healing mixture of lemon, honey and garlic. Grind all these substances with the help of a meat grinder, juicer or blender. Chop 5 lemons and 3-5 garlic cloves (peeled). Add 500 g of honey in the resulting mixture. Cover the jar tightly and leave in a dark place for about 2 weeks. Take 4 teaspoons before meals 2-3 times a day.